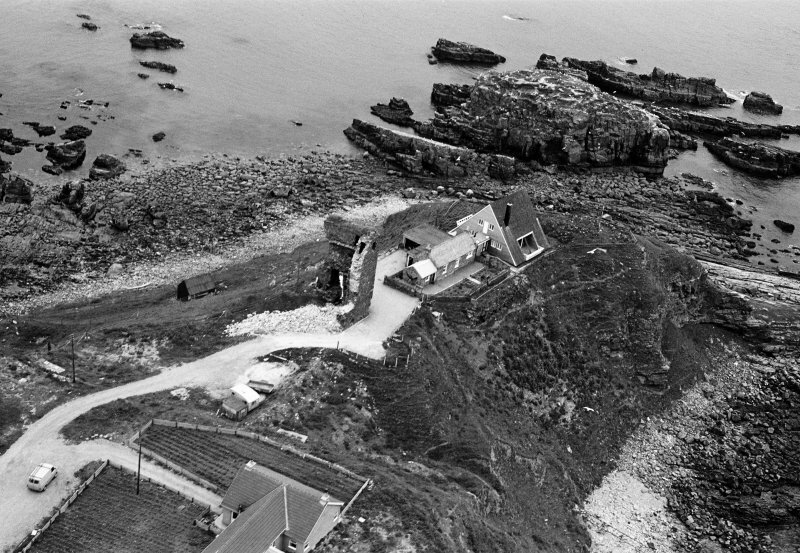 Oblique aerial view of Old Slains Castle, looking to the ESE. 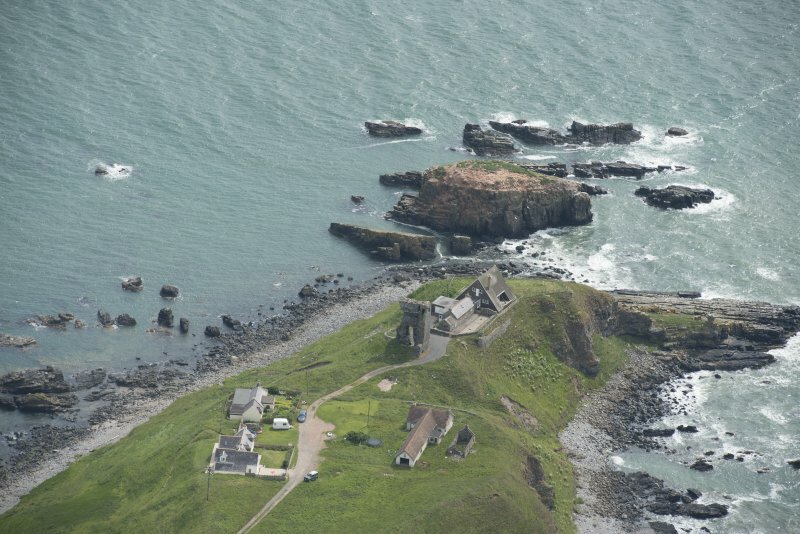 Oblique aerial view centred on the remains of Old Slains Castle with the house and village adjacent, looking to the ESE. 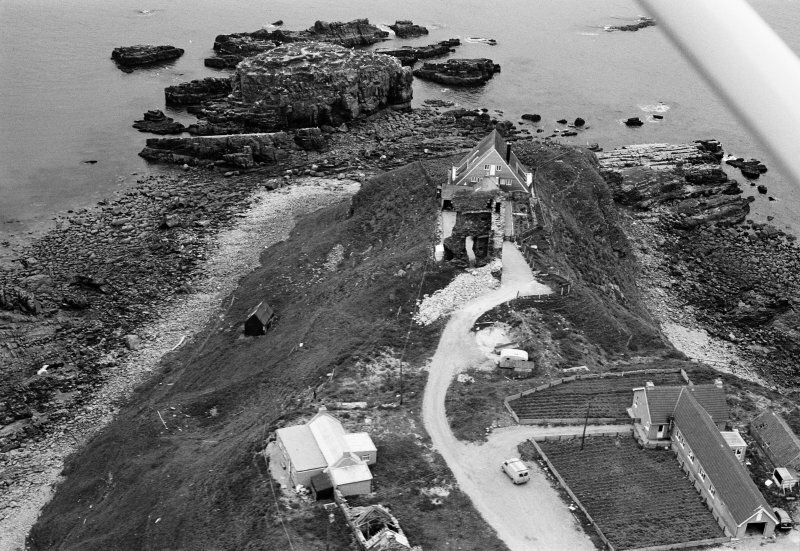 Oblique aerial view of Old Slains Castle, looking to the E.
Oblique aerial view centred on the remains of Old Slains Castle with the house and village adjacent, looking to the WSW. 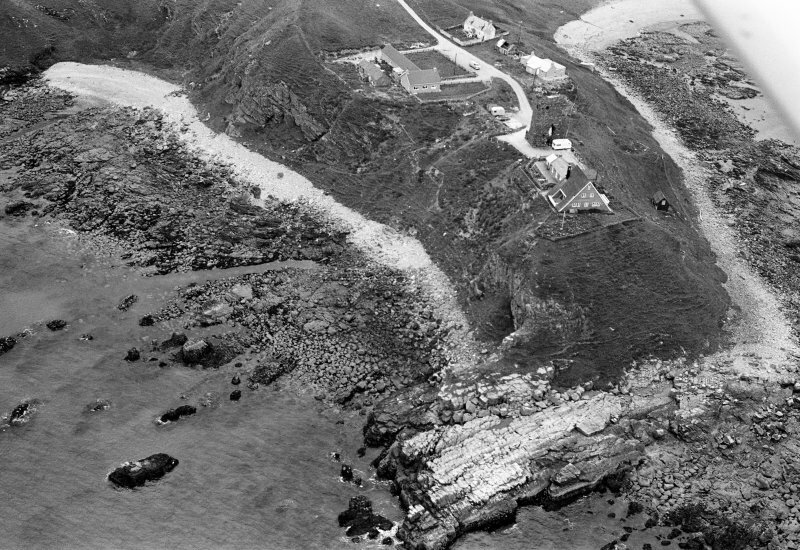 Oblique aerial view centred on the remains of Old Slains Castle with the house and village adjacent, looking to the WNW. Oblique aerial view centred on the remains of Old Slains Castle with the house and village adjacent, looking to the E.
Oblique aerial view centred on the remains of Old Slains Castle with the house and village adjacent, looking to the SW.
Oblique aerial view centred on the remains of Old Slains Castle with the house and village adjacent, looking to the NW. Old Slains Castle, 15th century. 'Crowning a steep peninsulated rock' (Groome), represented by stark fragment, c.8ft thick, of south-east angle of a vaulted tower of the Hays, which was blown up on the orders of James VI in 1594 in return for eighth Earl's support for the Earl of Huntly's rebellion that year. 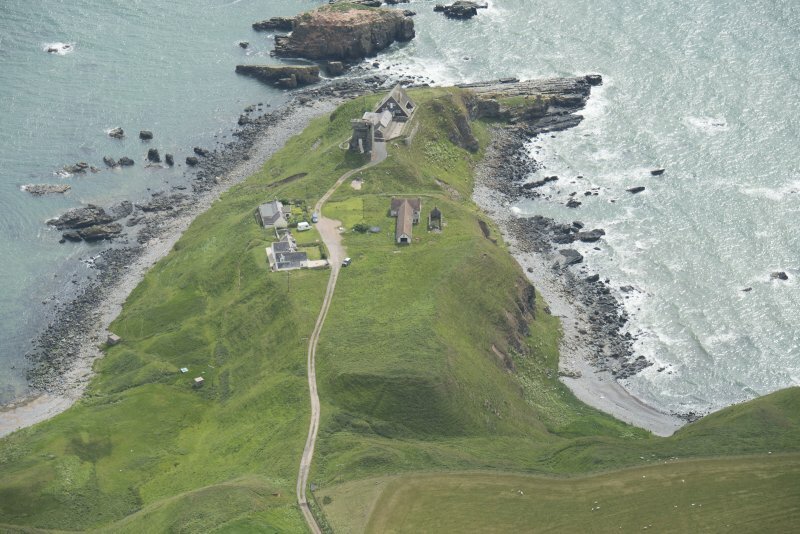 Not to be confused with Slains Castle (NK 1015 3610), for which see NK13NW 1. For nearby cannon, see NK03SE 19. Slains Castle stands on a rocky peninsula and appears to be the earliest example of the new type of tower house erected in the 14th century. It was demolished in 1594 and only the SE corner remains. There were two lines of defence. The inner spanned the narrowest part of the peninsula and consisted of a ditch, still well preserved, behind which was the barmkin wall and gateway. Of these little or nothing remains. The outer ward, on the slopes of the mainland, enclosed a well and was defended by earthen ramparts which may be older than the stone castle. W D Simpson 1940; D MacGibbon and T Ross 1887-92. 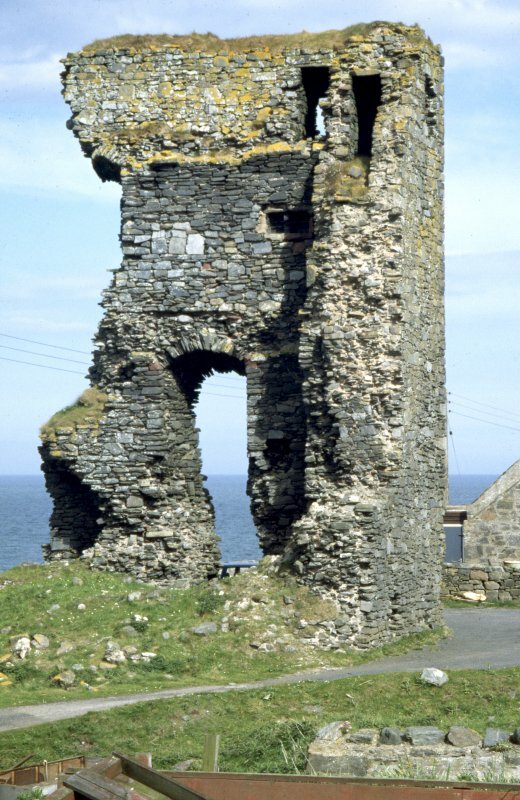 The remains of Slains Castle, a tower house, are as described by Simpson. 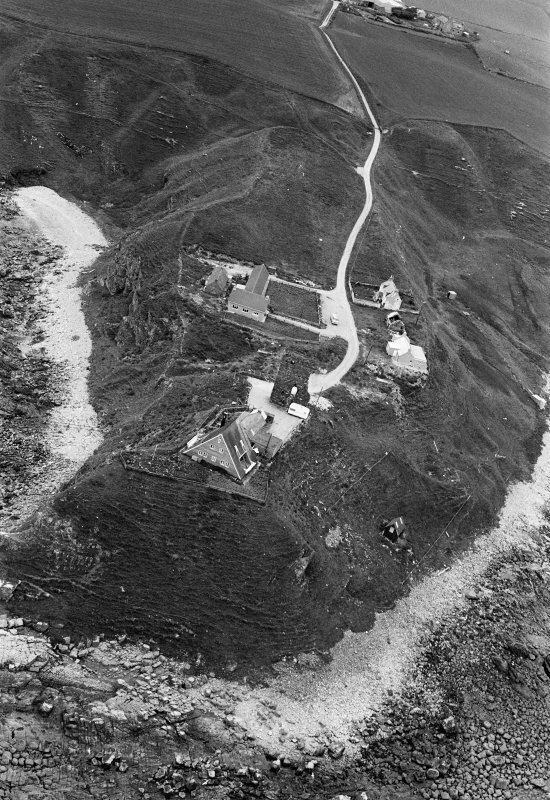 Traces of the barmkin wall can be seen in the face of the cliff to the S and SE of the tower house, but nothing remains of the gateway and wall. The ditch, which is partly natural, has been mutilated by late constructions. 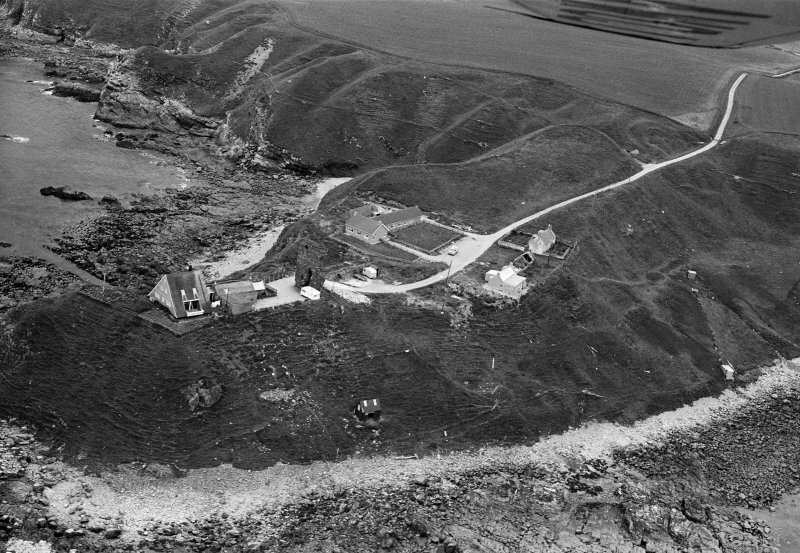 The "outer ward" is surrounded by steep natural slopes surmounted by a rampart of earth and some stones, about 3.0m wide and 1.0m maximum height, which survives only on the W and S. Late building has almost certainly destroyed it elsewhere. There is no trace of a well. Visited by OS (NKB) 4 September 1970. Visible on air photograph AAS/93/14/G30/28. Copy held by Grampian Regional Council. c. 8ft thick, of the SE angle of a vaulted tower of the Hays, which was blown up on the orders of James VI in 1594 in return for the eigthth Earl's support for the Earl of Huntly's rebellion that year. Information from Historic Scotland, scheduling document dated 6 November 2008.